Waukee Middle School (WMS) took time to thank their Durham bus drivers on February 12. WMS celebrated Love the Bus month by providing coffee and cookies for their bus drivers from 7:30-8 a.m.
February is Love the Bus month, a campaign by the American School Bus Council to raise awareness and appreciation for the hundreds of thousands of school bus drivers who safely transport children to and from school. 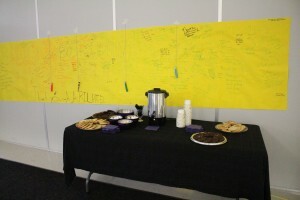 WMS celebrated Love the Bus month by providing coffee and cookies for their bus drivers from 7:30-8 a.m.
Students at Waukee Middle School created a banner filled with messages to thank their bus drivers.